If you don’t know much about the MDGs or even what they are, that’s okay! To read a recent EW post on the basics, click here. While we’ll be going into each of the eight MDGs (and specifically how they relate to women and girls) soon, a dialogue on figuring out what will replace the MDGs in 2015, currently termed “the post-2015 development agenda,” is already well underway, and you can participate in it! Thus, we thought some information about how the dialogue has unfolded so far, and how you can get involved, might be helpful. The Sustainable Development Goals (SDGs) Open Working Group was set-up this past January in response to recommendations from Rio+20, a United Nations Conference on Sustainable Development in 2012. While the working group is due to present its final recommendations to the UN General Assembly in September 2014, a draft report was released and opened for comments on 7 May, 2013. To read the draft report, click here. It remains to be seen however, if the SDGs will end up representing an entirely separate set of goals or will directly feed into the post-2015 development agenda. The UN-led Process has a number of different moving parts. UN Secretary General Ban Ki-moon announced the creation of a High Level Panel to advise on post-2015 development agenda. The panel is co-chaired by President Susilo Bambang Yudhoyono of Indonesia; President Ellen Johnson Sirleaf of Liberia and Prime Minister David Cameron of the United Kingdom. After holding meetings in each of co-chairs’ respective countries (as well as brief meeting at the 2012 General Assembly), the panel is scheduled to release its report at the end of May. And here’s where we as Ecumenical Women can lend our voice. All the links above will send you to specific consultation areas on the World We Want 2015, a web-platform created by the UN and civil-society to gather the priorities of people from every corner of the world. If you’d prefer to provide more general input, you can create a profile and then answer questions like “World leaders are creating new development goals. What needs to be included?” on the World We Want 2015. If you’d prefer to begin contributing through a basic survey, you can vote on your top priorities for development in the MY World survey. There are also a number of non-UN activities feeding into the post-2015 dialogue. Beyond 2015, for instance, is a global civil society campaign that brings together more than 620 organizations. So wow- that’s a lot of information, but we hope you found it helpful. Be sure to participate in the World We Want, the MY World survey and please leave us a comment if you have any questions or concerns. 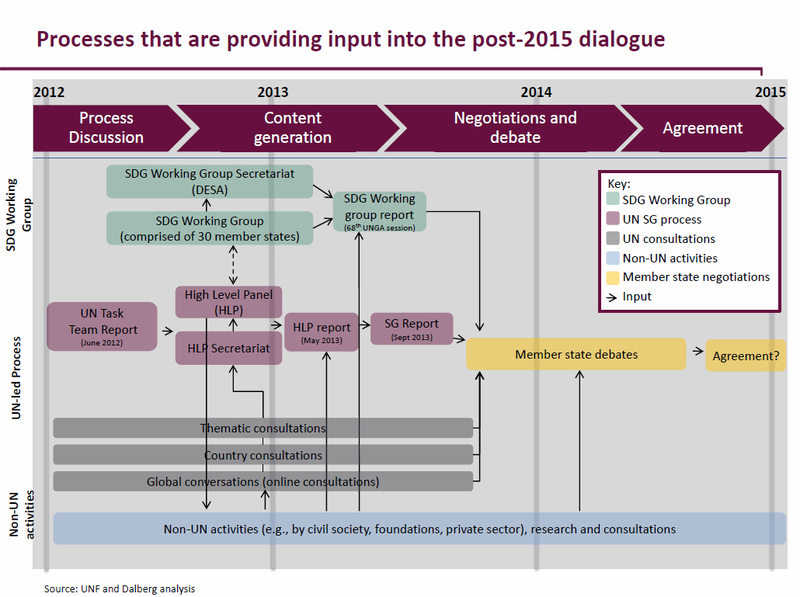 Finally, if you’re interested in a more detailed timeline of the post-2015 dialogue, the Guardian has created a great resource that you can find here.